One of today's frontrunners in the niche of alternative music that borders on reggae, Michael Franti & Spearhead is no stranger to the Tahoe Basin. Over the past two decades, the band has played the region upwards of 15 times, according to frontman Franti. 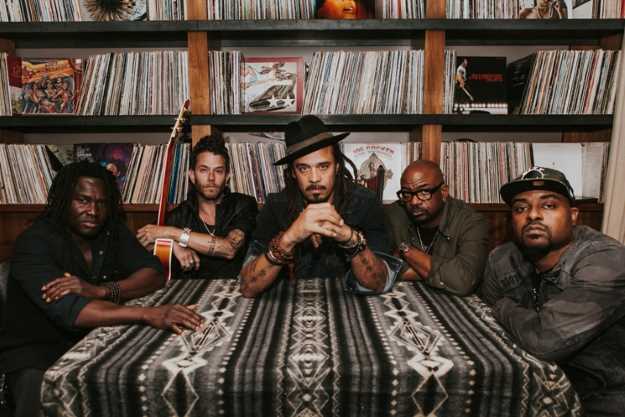 Ahead of the group's South Shore gig on Friday, Sept. 15, we chatted with Franti about Tahoe, social activism and how he brings humanitarianism into his music. ACTION: What are you looking forward to about being back? Franti: The main thing for me is that I love Tahoe as a natural paradise — before every time we play there I'll go out and sit or walk by the lake. Sometimes I'll dive in, sometimes I just find a deserted beach to hang out and usually end up talking with some locals who just happen to be there, or who might be going to the show. It's a great contrast to then being inside a casino. To have that kind of grounding element there, that's my speed. What's your favorite Tahoe pastime? It depends on the season. If it's summer, we've been blessed in the last year to have so much rain in Northern California that things are green, the lake is filled and the Truckee River is running and the American River is running. There are so many great things to do in the summertime with water. In the winter I would say I'm able to get down the mountain on a snowboard. I'm no expert, but I'm like the way that people ride a longboard or skateboard — just carve and get through town, and that's how I am. I'm definitely not throwing backflips off picnic tables up there. Tahoe is an amazing place in summer and winter. It's always great at the end of the day, whatever you're doing in Tahoe, to go and experience live music. Throughout the year there are so many bands that come and play, and we have fans who make a whole weekend of it — they come up and spend time at the lake, watch the show and spend time in the bars or at the tables at night. It's just a fun getaway for people, so we look forward to it. You grew up nearby; did you ever make trips to Tahoe? I grew up in Davis, California; I was born in Oakland. Part of the time my family would go back down to the Bay to visit friends; part of the time we would go up and go camping or backpacking in the summer, or make little ski trips up in the winter. The Northern California nature and environment is so unique in that way, that you could literally surf in the morning and ski in the afternoon if you want. I feel like as a Northern California kid I got to at least experience some of that growing up. You're an active humanitarian; what sparked that interest? When I was born I was given up for adoption. My birth mother is Irish, German and Belgian. Her family came to America as dreamers. My biological father is African American and Nottoway Indian and his family came over as slaves and indigenous Americans. I was adopted by the Franti family, who are second-generation immigrants from Finland, and their family also came over as dreamers seeking a better life. They had three kids of their own, and then they adopted myself and another African American son. Mom was a schoolteacher in public schools in California for 35 years. She raised us to be people who were inclusive. We grew up in this blended family, so it's always been part of my consciousness to be inclusive. I believe that everyone on the planet deserves to be happy, healthy and equal. When I see that there is either public policy or community sentiment that is contrary to those beliefs I speak out, I organize and write songs about it. The way I've grown over the years is that when I first started in music I would speak out against those things with anger, and now I try to channel my frustration into positive things, optimism and solution-oriented actions. That's really where my humanitarianism lies — in trying to find ways to inspire optimism that leads to positive action. What's the role that being a humanitarian plays in your life and music? The first way is that I'm a father; I've raised my kids to be that conscious and loving individual who cares about our community. The second is as a musician and voice in the world, I've tried to keep those beliefs at the center point of my music. Over the years we've done large-scale concerts in support of peace. After 9-11 we used to do Power to the Peaceful concerts in San Francisco for 80,000 people every year for 12 years. Just recently when we had this white nationalist and neo-Nazi rally take place, we put on a big concert in support of diversity and inclusion [in San Francisco]. We also do it on another level with our nonprofit, Do It For The Love, which brings children, adults and veterans with serious medical conditions or special needs to see any live concert by any artist in any city in North America. So we sent, in the last four years, over 1,000 families to see everything from Drake and Beyonce to Garth Brooks and Kenny Chesney to Metallica and opera, connecting hundreds of artists with fans and music. Your albums are inspired by politics and current events — what's going on right now that's inspiring you? I think the most obvious thing is that after this last election everyone's had emotional responses to it, whether you supported the outcome or were opposed to it. It's led to strong emotions for people. I'm someone who's committed to speaking passionately about what I believe in, but also having the ability to hold an open mind and open heart to people who have different opinions, or come from a different political perspective, sexuality, religion or cultural identity. I really believe that's the roadmap to the future: being able to speak passionately about what you believe in, but hold space for other differences. I write music that tries to encourage people to find the beauty in those differences, and not use them as things to divide people, but use them as ways to see how beautiful our cultures are because of the mix that we have. Look at what I believe is America's greatest artistic offering to the world: jazz and rock 'n' roll music. It's a perfect example of African rhythms and storytelling and rhyming put together with European harmonies and instrumentation, combined with all the voices of every culture who has come to this country and contributed to it, from Asian music to Celtic music, traditional Native American music — all these things led into the invention of jazz and ultimately to rock 'n' roll, and today hip hop and popular dance music. We put that out to the world and then the world placed their take on it and spun it back to us in new ways we never would've imagined. That's when things become beautiful and powerful and great. The same is true if we want to solve any issues that we see taking place. If we want to create 100 percent renewable energy for 100 percent of the planet, we need the best that science has to offer, we need the wisdom of indigenous people, we need the creativity — and, frankly, the balls — of entrepreneurs to invest in it. We need the common sense of everyday people to give their feedback, and use their purchasing power to support renewable energy. If we do that, then we can take into consideration the needs of people and places that I play at, like in Gulf Shores, Alabama, where they had the big oil spill a few years ago. If we can find ways to create new technologies and new jobs using the best and brightest minds that we have, then everyone will win. If we get mired in believing that we can't, ultimately we stay stuck where we are. Where is the most unique spot you've performed? I played on the streets of Baghdad in 2004, 11 months after the war started there. In the daytime I'd play for Iraqi civilians and at nighttime I'd play in bars for U.S. soldiers who were off duty. That was definitely one of the places I learned the most about the importance of music and how music, even on opposite sides of the war, was essential in helping the people access their emotions. I've played in prisons around the country, and I found the same thing there — how you start playing music and you see the guards, the wardens, the prisoners all clapping together, and all the different ethnic groups in the prison all celebrating music in the same way at the same time and it's an amazing thing. It defies everything you've been told. But I think my favorite place to play music, out of all the giant festivals we've done around the world, is still just playing music at my house. I love getting together, my son and I. My son is 18 — we make beats in my studio, we sit around and play guitars, we have a fire at night and my wife plays piano, we sit down together and we'll sing a song, or just put music on the radio and listen. I still feel like of all the places I've been to, the most powerful place I've played has been in my own house.